Odia /əˈdiːə/ or Oriya /ɒˈriːə/, both renderings of ଓଡ଼ିଆ oḍiā , is a language spoken by 3.2 % of India's population. It is an Indo-Aryan language that is spoken mostly in eastern India, with around 40 million native speakers as of the year 2016 from the state of Odisha, adjoining regions of its neighboring states and by the largely migrated Odia population across India. It is the predominant language of the Indian state of Odisha, where native speakers make up 80% of the population, and it is spoken in parts of West Bengal, Jharkhand, Chhattisgarh and Andhra Pradesh. Odia is one of the many official languages of India; it is the official language of Odisha and the second official language of Jharkhand. The language is also spoken by a sizable population of at least 10 million people in Chhattisgarh. Odia is the sixth Indian language to be designated a Classical Language in India on the basis of having a long literary history and not having borrowed extensively from other languages. The earliest known inscription in Odia dates back to the 10th century AD. Odia is mainly spoken in the state of Odisha, but there are significant Odia-speaking populations in other areas of India, such as the Midnapore district of West Bengal, the East Singhbhum, West Singhbhum Seraikela Kharsawan district, Simdega, Gumla, Khunti, Ranchi district of Jharkhand, the Srikakulam, Vizianagaram and Vishakhapatnam District of Andhra Pradesh, and the eastern districts of Chhattisgarh state. Due to the increasing migration of labour, the west Indian state of Gujarat also has a significant population of Odia speakers, with Surat being the city with the second largest Odia-speaking population in India. Significant numbers of Odia speakers can also be found in the cities of Vishakhapatnam, Hyderabad, Pondicherry, Bangalore, Chennai, Goa, Mumbai, Raipur, Jamshedpur, Baroda, Ahmedabad, New Delhi, Kolkata, Kharagpur, Guwahati, Shillong, Pune, and Silvassa. Kataki Odia or The Odia of Mughalbandi region is considered as proper or Standard Odia due to literary traditions. It is spoken mainly in the eastern half of the state of Odisha in districts like Khurdha, Puri, Khurdha, Cuttack, Jajpur, Jagatsinghpur, Kendrapada, Dhenkanal, Angul and Nayagarh district with little variation. Midnapori Odia: Spoken in the undivided Midnapore District of West Bengal. Baleswari Odia: Spoken in Baleswar, Bhadrak and Mayurbhanj district of Odisha. Ganjami Odia: Spoken in Ganjam and Gajapati districts of Odisha and Srikakulam district of Andhra Pradesh. Sambalpuri Odia / Kosli / Western Odia: Spoken in Bargarh, Bolangir, Boudh, Debagarh, Jharsuguda, Kalahandi, Nuapada, Sambalpur, Subarnapur and Sundargarh districts of Odisha and by some people in Raigarh, Mahasamund, Raipur districts of Chhattisgarh state. Desiya Odia: Spoken in Koraput, Rayagada, Nowrangpur and Malkangiri Districts of Odisha and in the hilly regions of Vishakhapatnam, Vizianagaram District of Andhra Pradesh. Bhatri: Spoken in South-western Odisha and eastern-south Chhattisgarh. Halbi: Spoken in undivided Bastar district of Chhattisgarh state is a mixture of Odia and Chatishgarihi tribal languages with major Marathi influence on it. Kurmi: Spoken in Northern Odisha and South west Bengal. Sounti: Spoken in Northern Odisha and South west Bengal. Bathudi: Spoken in Northern Odisha and South west Bengal. Kondhan: A tribal dialect spoken in Western Odisha..
Laria: Spoken in bordering areas of Chatishgarh and Western Odisha. Aghria: Spoken mostly by the ingenious people of Aghria caste in Western Odisha. Bhulia: Tribal form spoken in Western Odisha. Sadri: A mixture of Odia and Hindi language with major regional tribal influence. Bodo Parja / Jharia: Tribal dialect of Odia spoken mostly in Koraput district of Southern Odisha . Matia: Tribal dialect of Odia spoken in Southern Odisha. Bhuyan: Tribal dialect of Odia spoken in Southern Odisha. Reli: Spoken in Southern Odisha and bordering areas of Andhra Pradesh. Kupia: Spoken by Valmiki caste people in the Indian state of Telangana and Andhra Pradesh, mostly in Hyderabad, Mahabubnagar, Srikakulam, Vizianagaram, East Godavari and Visakhapatnam districts. Odia is an Eastern Indo-Aryan language belonging to the Indo-Aryan language family. It is thought to be directly descended from a Magadhi Prakrit similar to Ardha Magadhi, which was spoken in eastern India over 1,500 years ago, and is the primary language used in early Jain texts. Odia appears to have had relatively little influence from Persian and Arabic, compared to other major North Indian languages. Old Odia (3rd century BC): The earliest evidence of Old Odia is found in the 3rd century BC Ashoka edit of Dhauli and 1st century BC Hathigumpha inscription. The old colloquial literature is the Charyapada, poetry written in an Apabhraṃśa ancestral to Odia, Bengali, Assamese and Maithili. Early Middle Odia (1200–1400): The earliest use of prose can be found in the Madala Panji of the Jagannath Temple at Puri, which dates back to the 12th century. Such works as Shishu Veda, Amara Kosha, Gorakha Samhita, Kalasha Chautisha, and Saptanga are written in this form of Odia. Middle Odia (1400–1700): Sarala Das writes the Vilanka Ramayana. Towards the 16th century, poets emerged around the Vaishnava leader Acyutananda, These five poets are Balaram Das, Jagannatha Dasa, Acyutananda, Ananta Das and Jasobanta Das. Late Middle Odia (1700–1850): Usabhilasa of Sisu Sankara Das, the Rahasya-manjari of Deva-durlabha Dasa and the Rukmini-bibha of Kartikka Das were written. A new form of novels in verse evolved during the beginning of the 17th century when Ramachandra Pattanayaka wrote Haravali. Upendra Bhanja took a leading role in this period, his creations were Baidehisha Bilasa, Koti Brahmanda Sundari, Lavanyabati were proved landmark in Odia Literature. Dinakrushna Das’s Rasokallola and Abhimanyun samanta Simhara’s Bidagdha Chintamani are prominent Kavyas of this time. Four major poets emerged in the end of the era are Baladev Rath, Santha Kabi or Andha Muni Bhima Bhoi, Brajanath Badajena and Gopal Krushna Pattanaik. Modern Odia (1850 till present day): The first Odia printing typeset was cast in 1836 by the Christian missionaries which made a great revolution in Odia literature and language. Eastern Hemisphere in the year 200. The beginnings of Odia poetry coincide with the development of charya sahitya, the literature started by Vajrayana Buddhist poets such as in the Charyapada. This literature was written in a specific metaphor called twilight language and prominent poets included Luipa, Tilopa and Kanha. Jayadeva was a Sanskrit poet. He was born in an Utkala Brahmin family of Puri in circa 1200 AD. He is most known for his composition, the epic poem Gita Govinda, which depicts the divine love of the Hindu deity Krishna and his consort, Radha, and is considered an important text in the Bhakti movement of Hinduism. About the end of the 13th century and the beginning of the 14th, the influence of Jayadeva's literary contribution changed the pattern of versification in Odia. At a period when Odia was already a fixed and settled language, Bengali did not exist. The Bengalis spoke a vast variety of corrupt forms of Eastern Hindi. It is not till quite recent times that we find anything that can with propriety be called a Bengali language. We may place the Hindi with its subsidiary forms Gujurati and Punjabi first fixing their rise and establishment as a modern languages distinct from their previous existence as Prakrit till the 12th or 13th century. Odia must have quite completed its transformation by the end of the 14th century. Bengali was no separate independent language but a maze of dialects without a distinct national or provincial type till the 17th or beginning of the 18th century. It was not till the gradual decay of the central Mohammedan power of Delhi enabled the provincial governors to assume an independent position that Bengali severed itself from Hindi and assumed characteristics which now vindicate for its right to be called a separate language. Odia has twenty-eight consonant phonemes, two semivowel phonemes and six vowel phonemes. All vowels except /o/ also have nasal counterparts, but these are not always contrastive. Final vowels are standard and pronounced, e.g. Odia [pʰulo] contra Bengali [pʰul] "flower". The velar nasal [ŋ] is given phonemic status in some analyses. Nasals assimilate for place in nasal–stop clusters. /ɖ ɖʱ/ have the flap allophones [ɽ ɽʱ] in intervocalic position and in final position (but not at morpheme boundaries). Stops are sometimes deaspirated between /s/ and a vowel or an open syllable /s/+vowel and a vowel. Some speakers distinguish between single and geminate consonants. Unlike Hindi, Odia retains most of the cases of Sanskrit, though the nominative and vocative have merged (both without a separate marker), as have the accusative and dative. There are three genders (masculine, feminine and neuter) and two grammatical numbers (singular and plural). There are three true tenses (present, past and future), others being formed with auxiliaries. The earliest literature in Odia language can be traced to the Charyapadas composed in the 7th to 9th centuries. Before Sarala Das, the most important works in Odia literature are the Shishu Veda, Saptanga, Amara Kosha, Rudrasudhanidhi, Kesaba Koili, Kalasha Chautisha etc. In the 14th century, the poet Sarala Dasa's wrote the Sarala Mahabharata, Chandi Purana, and Vilanka Ramayana, in praise of the goddess Durga. Rama-bibaha, written by Arjuna Dasa, was the first long poem written in the Odia language. The following era is termed the Panchasakha Age and stretches until the year 1700. The period begins with the writings of Shri Chaitanya Mahaprabhu whose Vaishnava influence brought in a new evolution in Odia literature. Notable religious works of the Panchasakha Age include those of Balarama Dasa, Jagannatha Dasa, Yasovanta, Ananta and Acyutananda. The authors of this period mainly translated, adapted, or imitated Sanskrit literature. Other prominent works of the period include the Usabhilasa of Sisu Sankara Dasa, the Rahasya-manjari of Deva-durlabha Dasa and the Rukmini-bibha of Kartikka Dasa. A new form of novels in verse evolved during the beginning of the 17th century when Ramachandra Pattanayaka wrote Haravali. Other poets like Madhusudana, Bhima Bhoi, Dhivara, Sadasiva and Sisu Isvara-dasa composed another form called kavyas (long poems) based on themes from Puranas, with an emphasis on plain, simple language. However, during the Bhanja Age (also known as the Age of Riti Yuga) beginning with turn of the 18th century, verbally tricky Odia became the order of the day. Verbal jugglery, obscenity and eroticism characterise the period between 1700 and 1850, particularly in the works of the era's eponymous poet Upendra Bhanja (1670–1720). Bhanja's work inspired many imitators of which the most notable is Arakshita Das. Family chronicles in prose relating religious festivals and rituals are also characteristic of the period. The first Odia printing typeset was cast in 1836 by Christian missionaries. 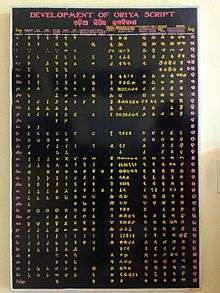 Although the handwritten Odia script of the time closely resembled the Bengali and Assamese scripts, the one adopted for the printed typesets was significantly different, leaning more towards the Tamil script and Telugu script. Amos Sutton produced an Oriya Bible (1840), Oriya Dictionary (1841–43) and An Introductory Grammar of Oriya (1844). Odia has a rich literary heritage dating back to the thirteenth century. Sarala Dasa who lived in the fourteenth century is known as the Vyasa of Odisha. He translated the Mahabharata into Odia. In fact, the language was initially standardised through a process of translating classical Sanskrit texts such as the Mahabharata, Ramayana and Srimad Bhagabatam. The translation of the Srimad Bhagabatam by Jagannatha Das was particularly influential on the written form of the language. Odia has had a strong tradition of poetry, especially devotional poetry. Other eminent Odia poets include Kabi Samrat Upendra Bhanja and Kabisurya Baladev Ratha. Prose in the language has had a late development. Three great poets and prose writers, Kabibar Radhanath Ray (1849–1908), Fakir Mohan Senapati (1843–1918) and Madhusudan Rao (1853–1912) made Odia their own. They brought in a modern outlook and spirit into Odia literature. Around the same time the modern drama took birth in the works of Rama Sankara Ray beginning with Kanci-Kaveri (1880). Among the contemporaries of Fakir Mohan, four novelists deserve special mention:Aparna Panda, Mrutyunjay Rath, Ram Chandra Acharya and Brajabandhu Mishra. Aparna Panda's Kalavati and Brajabandhu Mishra's Basanta Malati were both published in 1902, the year in which Chha Mana Atha Guntha came out in the book form. Brajabandhu Mishra's Basanta Malati, which came out from Bamanda, depicts the conflict between a poor but highly educated young man and a wealthy and highly egoistic young woman whose conjugal life is seriously affected by ego clashes. Through a story of union, separation and reunion, the novelist delineates the psychological state of a young woman in separation from her husband and examines the significance of marriage as a social institution in traditional Indian society. Ram Chandra Acharya wrote about seven novels during 1924-1936. Interestingly all his novels are historical romances based on the historical events in Rajasthan, Maharashtra and Odisha. Mrutyunjay Rath's novel, Adbhuta Parinama, published in 1915, centres round a young Hindu who gets converted to Christianity to marry a Christian girl. One of the great writers in the 19th century was Pandit Krushna Chandra Kar (1907-1995) from Cuttack, who wrote many books for children like Pari Raija, Kuhuka Raija, Panchatantra, Adi Jugara Galpa Mala, etc. He was last felicitated by the Sahitya Academy in the year 1971-72 for his contributions to Odia literature, development of children's fiction, and biographies. One of the prominent writers of the 19th and 20th centuries was Muralidhar Mallick (1927–2002). His contribution to Historical novels is beyond words. He was last felicitated by the Sahitya Academy in the year 1998 for his contributions to Odia literature. His son Khagendranath Mallick (born 1951) is also a well-known writer. His contribution towards poetry, criticism, essays, story and novels is commendable. He was the former President of Utkal Kala Parishad and also former President of Odisha Geeti Kabi Samaj. Presently he is a member of the Executive Committee of Utkal Sahitya Samaj. Another illustrious writer of the 20th century was Mr. Chintamani Das. A noted academician, he was written more than 40 books including fiction, short stories, biographies and storybooks for children. Born in 1903 in Sriramachandrapur village under Satyabadi block, Chintamani Das is the only writer who has written biographies on all the five 'Pancha Sakhas' of Satyabadi namely Pandit Gopabandhu Das, Acharya Harihara, Nilakantha Das, Krupasindhu Mishra and Pandit Godabarisha. Having served as the Head of the Odia department of Khallikote College, Berhampur, Chintamani Das was felicitated with the Sahitya Akademi Samman in 1970 for his outstanding contribution to Odia literature in general and Satyabadi Yuga literature in particular. Some of his well-known literary creations are 'Bhala Manisha Hua', 'Manishi Nilakantha', 'Kabi Godabarisha', 'Byasakabi Fakiramohan', 'Usha', 'Barabati'. 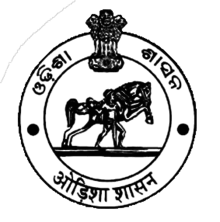 20th century writers in Odia include Pallikabi Nanda Kishore Bal (1875–1928), Gangadhar Meher (1862–1924), Chintamani Mahanti and Kuntala-Kumari Sabat Utkala-Bharati, besides Niladri Dasa and Gopabandhu Das (1877–1928). The most notable novelists were Umesa Sarakara, Divyasimha Panigrahi, Gopala Praharaja and Kalindi Charan Panigrahi. Sachi Kanta Rauta Ray is the great introducer of the ultra-modern style in modern Odia poetry. Others who took up this form were Godabarisha Mohapatra, Mayadhara Manasimha, Nityananda Mahapatra and Kunjabihari Dasa. Prabhasa Chandra Satpathi is known for his translations of some western classics apart from Udayanatha Shadangi, Sunanda Kara and Surendranatha Dwivedi. Criticism, essays and history also became major lines of writing in the Odia language. Esteemed writers in this field were Professor Girija Shankar Ray, Pandit Vinayaka Misra, Professor Gauri Kumara Brahma, Jagabandhu Simha and Harekrushna Mahatab. Odia literature mirrors the industrious, peaceful and artistic image of the Odia people who have offered and gifted much to the Indian civilization in the field of art and literature. Now Writers Manoj Das's creations motivated & inspired people towards a positive lifestyle .Distinguished prose writers of the modern period include Fakir Mohan Senapati, Madhusudan Das, Godabarisha Mohapatra, Kalindi Charan Panigrahi, Surendra Mohanty, Manoj Das, Kishori Charan Das, Gopinath Mohanty, Rabi Patnaik, Chandrasekhar Rath, Binapani Mohanty, Bhikari Rath, Jagadish Mohanty, Sarojini Sahoo, Yashodhara Mishra, Ramchandra Behera, Padmaja Pal. But it is poetry that makes modern Odia literature a force to reckon with. Poets like Kabibar Radhanath Ray, Sachidananda Routray, Guruprasad Mohanty, Soubhagya Misra, Ramakanta Rath, Sitakanta Mohapatra, Rajendra Kishore Panda, Pratibha Satpathy have made significant contributions towards Indian poetry. Anita Desai's novella, Translator Translated, from her collection The Art of Disappearance, features a translator of a fictive Odian short story writer; the novella contains a discussion of the perils of translating works composed in regional Indian languages into English. Four writers in Odia - Gopinath Mohanty, Sachidananda Routray, Sitakant Mahapatra and Pratibha Ray - have been awarded the Jnanpith, a prestigious Indian literary award. ↑ Bureau, Odishatv. "Odia as official language from tomorrow; linguists doubtful on efficacy of Act | Odisha Television Limited". odishatv.in. Retrieved 16 August 2016. ↑ Mahapatra, B. P. (2002). Linguistic Survey of India: Orissa (PDF). Kolkata, India: Language Division, Office of the Registrar General. p. 14. Retrieved 20 February 2014. ↑ "Oriya gets its due in neighbouring state- Orissa- IBNLive". Ibnlive.in.com. 2011-09-04. Retrieved 2012-11-29. ↑ "Bengali, Oriya among 12 dialects as 2nd language in Jharkhand". daily.bhaskar.com. 2011-08-31. Retrieved 2012-11-29. ↑ "Odia gets classical language status". The Hindu. 20 February 2014. Retrieved 20 February 2014. ↑ "Odia becomes sixth classical language". The Telegraph. Retrieved 29 March 2015. ↑ "Milestone for state as Odia gets classical language status". The Times of India. Retrieved 29 March 2015. ↑ Pattanayak, Debi Prasanna; Prusty, Subrat Kumar. Classical Odia (PDF). Bhubaneswar: KIS Foundation. p. 54. Retrieved 26 July 2016. ↑ "Official and Regional Languages of India". 2011-01-25. Archived from the original on 2013-03-08. Retrieved 2012-11-29. 1 2 Institute of Social Research and Applied Anthropology (2003). Man and Life. 29. Institute of Social Research and Applied Anthropology. Retrieved 31 July 2012. ↑ Subhakanta Behera (2002). Construction of an identity discourse: Oriya literature and the Jagannath cult (1866-1936). Munshiram Manoharlal Publishers. Retrieved 31 July 2012. ↑ Misra, Bijoy (April 11, 2009). Oriya Language and Literature (PDF) (Lecture). Languages and Literature of India. Harvard University. ↑ Classical Odia (PDF). Bhubaneswar: Government of Odisha. Retrieved 16 July 2015. 1 2 Patnaik, Durga (1989). Palm Leaf Etchings of Orissa. New Delhi: Abhinav Publications. p. 11. ISBN 9788170172482. 1 2 Panda, Shishir (1991). Medieval Orissa: A Socio-economic Study. New Delhi: Mittal Publications. p. 106. ISBN 9788170992615. 1 2 Patnaik, Nihar (1997). Economic History of Orissa. New Delhi: Indus Publishing. p. 149. ISBN 9788173870750. ↑ Sukhdeva (2002). Living Thoughts of the Ramayana. Jaico Publishing House. p. 7. ISBN 978-81-7992-002-2. ↑ Sujit Mukherjee (1998). A Dictionary of Indian Literature: Beginnings-1850. Orient Blackswan. p. 420. ISBN 978-81-250-1453-9. ↑ Medieval Indian Literature: Surveys and selections. Sahitya Akademi. 1997-01-01. ISBN 9788126003655. ↑ The Encyclopaedia Of Indian Literature (Volume Two) (Devraj To Jyoti): 2 p1030 ed. Amaresh Datta - 2006 "Amos Sutton also prepared a dictionary named Sadhu bhasharthabhidhan, a vocabulary of current Sanskrit terms with Odia definitions which was also printed in Odisha Mission Press in 1844." Masica, Colin (1991). The Indo-Aryan Languages. Cambridge Language Surveys. Cambridge: Cambridge University Press. ISBN 978-0-521-29944-2. Neukom, Lukas; Patnaik, Manideepa (2003). A Grammar of Oriya. Arbeiten des Seminars für Allgemeine Sprachwissenschaft der Universität Zürich. Zurich: University of Zurich. ISBN 9783952101094. Ray, Tapas S. (2003). "Oriya". In Cardona, George; Jain, Dhanesh. The Indo-Aryan Languages. Routledge. pp. 485–522. ISBN 978-0-7007-1130-7. "Oriya Language and Literature" (PDF). Odia.org. Retrieved 2012-11-29. Wikimedia Commons has media related to Odia language. Praharaj, G.C. Purnnachandra Ordia Bhashakosha. Cuttack: Utkal Sahitya Press, 1931-1940.